Monday 8 Oct 2012. My left leg is playing up; the varicose veins are back. I’ve had two operations on the laughable limb over the last fifteen years, stripping out the unsightly noodles, first by knife then by laser. But the things do tend to return and this time I may have to just live with them. I understand the NHS doesn’t do the operation any more unless it’s life-threatening. Still, a surgical stocking can alleviate the aches, so this morning I dig mine out and put it on. Its colour is an optimistic tan. Given my other leg is as pale as the tenant of a tomb (as Poe put it), my legs together resemble a novelty biscuit. It’s just as well I never wear shorts. Tonight: to Gordon Square for the first proper class of the second year in my English BA. Monday evenings are now ‘Aspects of Medieval and Renaissance Literature’, Tuesdays are ‘The Novel’, while Wednesdays are ‘Narratives Of The Body’, being a deliciously varied module from the Humanities department. The first texts we’re studying are, respectively, Mr Chaucer’s poem Troilus and Criseyde (c. 1380), Ms Atwood’s novel The Handmaid’s Tale (1985), and Mr Lang’s film Metropolis (1927). The spice of life, indeed. 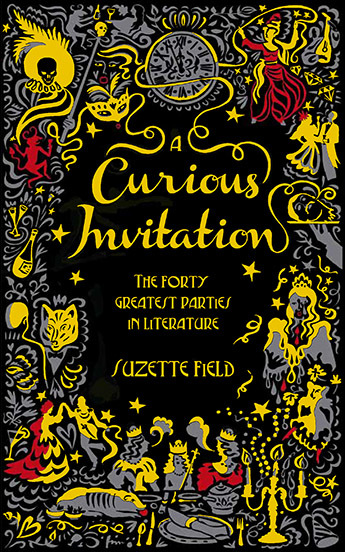 I’m currently helping Suzette Field of the Last Tuesday Society spread the word about her new book, A Curious Invitation. It’s a detailed look at the greatest parties in literature, my own suggestion to her being the flying party in Douglas Adams’s Life, The Universe and Everything. I was delighted to discover she’d included it in her final selection. It’s probably the first – and last – book to discuss Joyce’s Finnegan’s Wake alongside Jackie Collins’s Hollywood Wives. Something of a genre-spanning feast for booklovers, it’s out in Picador this month, and naturally I highly recommend it. There’s a website all about it at http://acuriousinvitation.com.